I have been working on block 11 over the past couple of days. I have all the regular stitching done, now I'm just working on filling in with the black. I also got the border for block 10 finished and pulled the threads for it. I just love the colors in that block, especially the reds. Well, nothing going on here. Just hanging out with the kids and stitching today! :) Write soon! Beautiful work! Quite tempting, too. Ooh, Nicole–How Gorgeous! If you keep this pace you'll have her done in time for the holiday! Is that your "unspoken" goal? It's looking so pretty, Nicole! You're moving out quickly it looks like! I'll really enjoy watching your progress! Watch you go!!! Great progress and while I love everything about this design, that ship block has a firm hold on my heart. Making great progress with this one, Nicole! It looks fabulous Nicole. I enjoy watching your progress on this piece. very, very nice! Makes me want to pick up mine and get with it! Makes me want to run out and buy it! Can't wait to see the next block! Great job so far! I love the colors on this set of blocks. I can't wait to see your next update. Wow, your blazing fast needle never fails to amaze me. Great job so far!! Looks great!! I love the next block, cant wait to see it stitched up. Wow, YGG Nicole! It looks great! I love that block--you'll be finished in no time! Nicole, I your CaHRH progress is really beautiful! I love the color of the fireworks in block 11. And block 12 for that matter. Actually,I like how CaHRH is so colorful. I'm looking forward to seeing block 10! So nice! Wow, that is really amazing! Very very beautiful! Careful, lady. If you keep this up I may feel inspired enough to purchase this design and add it to my SAL list, where it shall remain till eternity, of course. In the meantime, LOVE your progress. What a beauty! Beautiful! Having fun watching your CoHRH come to life! Very pretty! I love filling in, you don't have to think when you are doing it :-). Love the colors in this block! So pretty. YOU are a stitching machine! It's beautiful. Great progress Nicole and those black blocks take forever don't they? WOW - you are making awesome progress!! It looks so great! 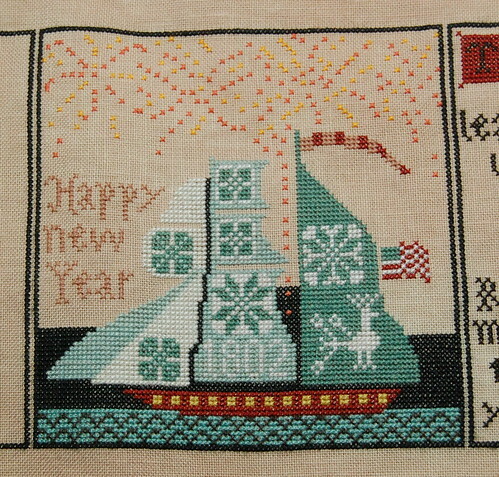 My favorite block is the Happy New Year one. I have a question. Can you tell me what it is about Lakeside Linens that you love so much? I am looking for more neutral linens to go with some patterns I have and I see you use this fabric on almost every pattern you stitch and I was just curious. Thanks.